Numerous chefs are weighing in on the bombshell that diners in New York are putting on RUBBER GLOVES to eat crawfish. You can't be serious. In honor of Lobster Roll Week, Food Republic has former Top Chef contest Sam Talbot's recipe for a Butter-Poached Lobster Roll. Bon Appetit has a list of 16 restaurants that are or used to be gas stations including Charleston's Xiao Bao Biscuit and Rutledge Cab Co. The magazine also has a list of nine amazing things built out of old cans and bottles. Sascha Baron Cohen has reportedly dropped out of a Freddie Mercury biopic after a falling out with the surviving members of Queen. A Subway sandwich artist does something very, very gross to a loaf of bread. Penn State's new health insurance requirements are ridiculous. Not, seemingly, unlike anything that goes on in Happy Valley. A controversy over asparagus in St. Louis. No, really. Apple is refunding $6,000 in in-game purchases spent by an 8-year-old. 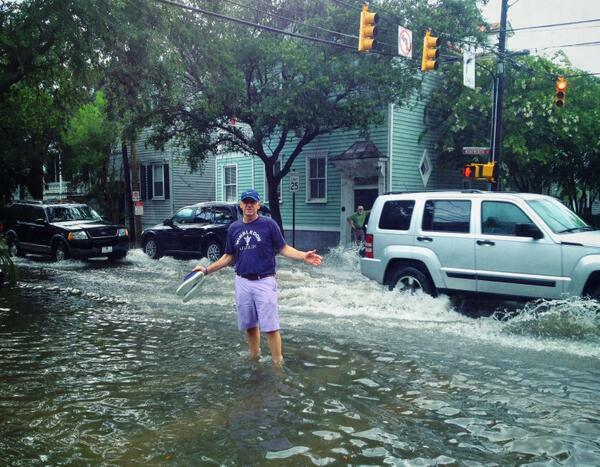 Check out this awesome photo Kevin Spacey had taken of him standing in the middle of a flooded Wentworth Street in Charleston. Florence Welch of Florence + The Machine crashed a cover band's gig, got drunk and covered Daft Punk's hit "Get Lucky." A new single from Philadelphia rockers, Dr. Dog. I didn't really see what the big deal was with fictional band Jesse and The Rippers reuniting on "Late Night With Jimmy Fallon" but this picture of John Stamos taking a picture of his dressing room placard is kind of cool. Oh, and there's a new member of England's royal family. Looks like that fight with a raccoon landed Digg founder and "Diggnation" co-host in the hospital. Skateboard legend Tony Hawk shot this cool video from Tokyo's famed Tsukiji Fish Market. There's a ton of gorgeous photography on Instagram but Chicago photograph Yewon Kim has been producing some of my favorite frames, including this gorgeous shot of Chicago.